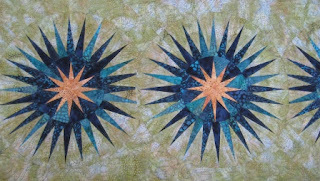 Here are some great quilts from one of my customers. She would like to stay anonymous. The first one is a New York Beauty table runner. I love the colours, lime green and blue. 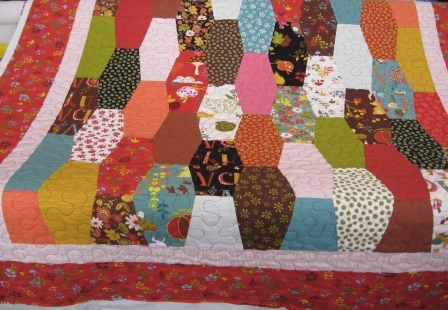 The bottom quilt was a lap quilt to be given away as a gift. 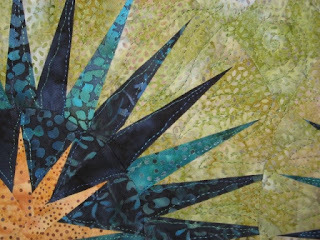 Lots of fun fabric in this quilt. Later this week is the Canadian National Juried Show and I can show you my enter on Wednesday. I got a call from the committee people today so I think the judging is happening today. They were asking if the machine quilting was on a long arm or domestic machine, Long arm for me of course. If you are any where near London Ont. You had better look into going this week. You do not want to miss the quilts.